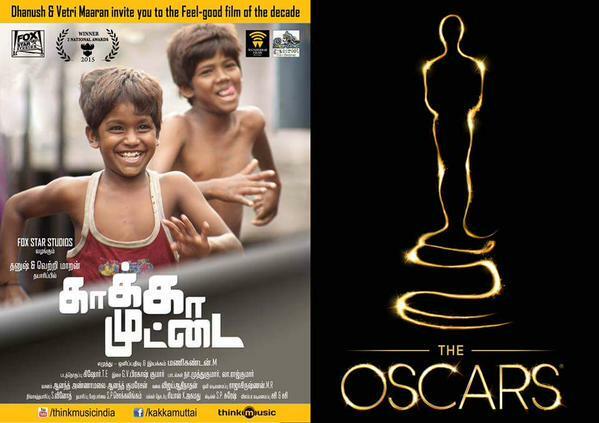 Filmmaker Manikandan's critically -acclaimed Kaaka Muttai is in the race for a place in Oscar's Best Foreign Film category from India. A team of juries headed by veteran actor-filmmaker Amol Palekar will take a final call. Also in the contention are Aamir Khan's PK, Rajamouli's epic Baahubali and Priyanka Chopra starrer Mary Kom. Kaaka Muttai was produced by Dhanush's Wunderbar Films in association with Grass Root Film Company of Vettrimaran. It was released by Fox Star. The movie not only won several acclaims including National Fillm Award for best regional film but also made it big at the box office. It featured newcomers Vignesh and Ramesh, in the lead roles alongside Aishwarya Rajesh. And music was composed by G V Prakash Kumar. Kaaka Muttai's story revolves around two slum children whose desire is to taste a pizza.